Are you all still enjoying The Anni-Verve-Sary blog hop that's going on? I know I sure am. I can't wait to see all the new releases Friday night!! 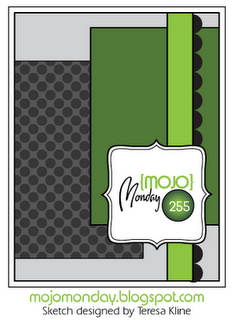 I am here today to share my card for this week's Mojo Monday sketch. I decided to use Verve's "Beautiful Kindness" set and focused on the sentiment. The pattern papers are from the Stella Rose collection (Mabel papers) by My Mind's Eye. I used Pure Poppy, Hawaiian Shores and Simply Chartreuse papers from Paper Trey ink. Lots of sparkle on this card today! Lots of challenges for this card, so I'm going to say goodbye for now so I can get all the links done. Dori this is so beautifully designed and the colours are perfect. Hop on over to Doing Life - for a chance to win some lovely digi stamps to value of 20$. I just LOVE all of the happy color on this card! BEAUTIFUL! What a lovely bright card. Thanks for taking part in the Cupboard Trilogy Challenge. Very, very pretty! I like the colors! Thank you for joining us at Stampin Sisters in Christ! The Best Part of This challenge is all of the wonderful Entries. I love the image and the design. Beautiful Card, love the colour combo too, it will definately bring a smile to the recipient. Thanks for joining us at the The Cupboard Trilogy Challenges & good luck! I am loving the bright Blue embossed paper, it goes so well with the bright coloured flowers. Thank you for joining in with our challenge over at The cupboard Trilogy Challenge Blog. Nice card. Thanks for joining us at Stamp with fun. This is gorgeous. The sentiment is beautiful and I love the cheery colours. Wow! This is a fantastic colorful card! The colors in your card amazing and I just love the addition of the ribbon! Thanks for joining us this month at Unique Crafters Challenge!